I’ve been thinking these past weeks about how to post a number of reviews I have in my Evernote tasting log. After experimenting with different formats I think I have arrived at a good starting point that will be refined as I go through your feedback and by just posting reviews. Since wineries have sampled more than they ever have over the past few months, many of these reviews will be disclosed as such and this got me thinking about a more formal disclosure about how I taste and review wines. When I started 4 and a half years ago I bought all my wines at retail. I still buy a fair amount today and these wines are not labeled after the retail price I paid. Since I live in a State that likes to tax and control the sale of alcohol to the extreme, your retail price will most likely be lower. All samples provided for review are labeled after the winery suggested retail price with the “/sample” tag. For the rare case of wines tasted in tasting rooms, wine events or trade tastings I will be using a new tag, “/tasting”, to denote that I have tasted under these conditions. I usually do not post these reviews as I will be tasting a number of wines in the, “sniff, taste, spit,” routine. Wines I especially like will be tasted twice before I make notes. Most of the notes posted here with this tag will be in more controlled winery tasting room or barrel cellar conditions. I think these disclosures are important to the reader as it shows how long I have spent with each wine before writing down my impressions. For all samples and wines bought at retail this is typically over the course of 2-3 days, in controlled conditions with and without food. After tasting, the bottles are topped with inert gas to prevent oxidation. Notes written at tastings are 2-3 minute snapshots of wines which tends to favor the most concentrated and aromatic wines which is why I typically don’t post those reviews. Usually I pick up bottles of the wines I like at tastings to taste later at home. Unless I make it clear in the review none of the wines are tasted blind. 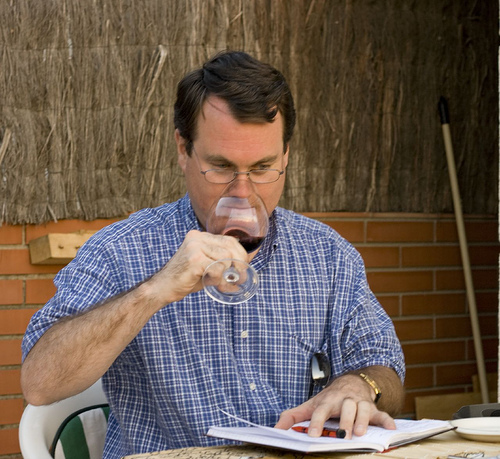 As samples accumulate from the same varietal, I will do more blind tastings and indicate this in my notes. There are a smattering of scales used on reviews here over the years. I used a 20 point scale (1-10 with half point increments) for a while before converting to the 100-point scale (using Robert Parker’s method). Over the past several months I have exclusively used a 5-star scale I proposed for bloggers some time ago and plan to continue to use this scale going forward. I really don’t like putting a numerical rating on wines but it does provide the reader with some context even if highly subjective. I will also start posting all reviews on Snooth and linking back to each review here to help readers find these wines. Finally, I have no formal wine education other than reading books and tasting wines on a nearly daily basis since 1982. While Malcolm Gladwell’s 10,000 hour rule might suggest I have reached some sort of expert status in evaluating wine I, like other tasters, still have a lot to learn. My intention is to continue to taste as many wines as I can exploring new varieties and regions and share what I like here. It’s really as simple as that. Let me know if you have any questions and check out my code of ethics and samples policy posted elsewhere on the site. I really like your review style and think tasting and reviewing over a number of days, with and without food gives a more complete and holistic opinion. I also think your transparency on sharing these factors in this post is quite refreshing. I think we can all appreciate the fact that you've been aware enough to share your process. I do think that gives you an aspect of respectability that some bloggers lack.